This is a small 10cm tall handcrafted statue of Freya made from ceramics. It can be ordered alone, or with an optional sun post or stone post. Freya (Old NorseFreyja, “Lady”) is one of the preeminent goddesses in Norse mythology. She’s a member of theVanir tribe of deities, but became an honorary member of theAesir gods after the Aesir-Vanir War. Her father is Njord. Her mother is unknown, but could be Nerthus. Freyr is her brother. 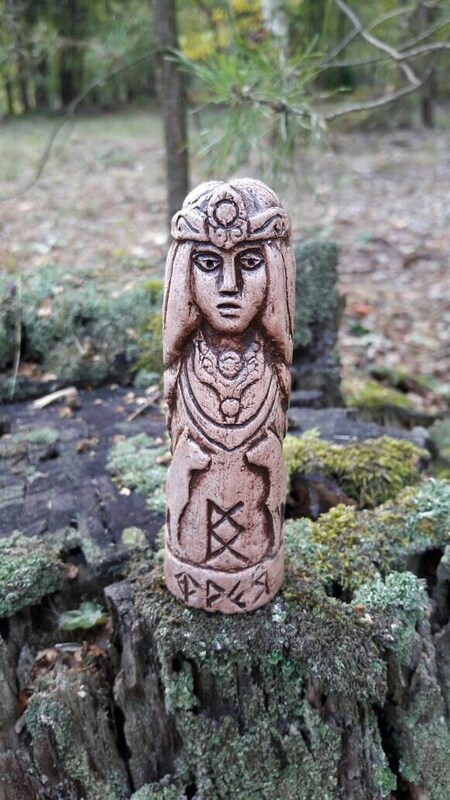 Her husband, named Odr in late Old Norse literature, is certainly none other than Odin, and, accordingly, Freya is ultimately identical with Odin’s wifeFrigg (see below for a discussion of this). Freya is famous for her fondness of love, fertility, beauty, and fine material possessions – and, because of these predilections, she’s considered to be something of the “party girl” of the Aesir. In one of the Eddic poems, for example,Loki accuses Freya (probably accurately) of having slept with all of the gods andelves, including her brother. She’s certainly a passionate seeker after pleasures and thrills, but she’s a lot more than only that. Freya is the archetype of the völva, a professional or semiprofessional practitioner of seidr, the most organized form of Norse magic. It was she who first brought this art to the gods, and, by extension, to humans as well. Given her expertise in controlling and manipulating the desires, health, and prosperity of others, she’s a being whose knowledge and power are almost without equal. Freya presides over the afterlife realmFolkvang. According to one Old Norse poem, she chooses half of the warriors slain in battle to dwell there. I will be a repeat customer, thank you! I love it, great quality and very detailed. So special- a wonderful addition to my altar. Thank you! I bought this Freya statue for my good friend and she absolutely loves Her. Not only is She beautiful, but a lovely poem was enclosed with Her.